Retired secondary school pricipal Satwant Kaur has taken over the helm of the Sikh Women Awareness Network (SWAN), replacing Rajinder Kaur who has been the president of the women organisation since its inception in 2004. The change in leadership took place at SWAN’s 11th annual general meeting attended by some 40 members at Petaling Jaya, Selangor, on Sunday (29 Mar). Rajinder has been appointed as the deputy president. “I told the team its not nice to have someone leading for so long. But nobody wants to take over. “We managed to convince Satwant. She agreed to take over provided I remain on board. She has her hands full with heading the PJ Punjabi school,” Rajinder told Asia Samachar. “I’m passionate about women activities. I feel good doing them. This Sunday, we have a grooming session for dining etiquette. A consultant is coming over to teach women participants the proper things to do when you go out for a formal dining,” she said. Satwant is no new face to the organisation as she has been its deputy president for many years. Since this year, Satwant also was appointed as the head of the Punjabi Education Centre (PEC) Petaling Jaya, which had 19 teachers and 215 students as of last year. Daljeet Kaur Randhawa is now the honorary secretary taking over from Ranvir Kaur. One of the organisation’s achievements over the years is the establishment of SWAN Centre which allows the women to embrace new ideas, skills, knowledge and tap their potential. 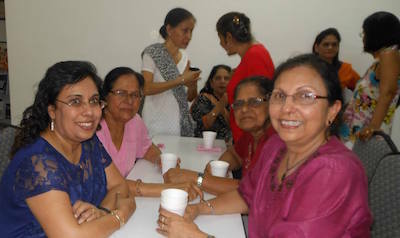 Other than regular health talks, SWAN also organises seminars and camps, and weekly skills training workshops on baking, cooking, crafts and computer classes. It also organises the Golden SWANs programme every Thursday morning to empower and uplift our senior ladies. The programme is intended to allow them to network, learn to keep fit with regular exercises and workout and engage in hands on activities to keep themselves mentally alert. “Outdoor trips are arranged regularly. We’ve gone on lake cruise to Putrajaya and picnics. Every Friday mornings, a bollyrobics class is conducted for all women,” said Rajinder. With the rise of personal, social and psychological problems in the community, SWAN has embarked on in-house para-counseling training courses and regular counseling sessions are conducted by our in-house trained counselors. It is open to all. An entrepreneurship initiative to provide basic skills training and financial opportunities is also ongoing. “SWAN also helps our ladies to acquire free sewing machines, baking ovens and required training to enable them to start business from home to improve their family’s financial standing,” she said. SWAN Sirjana Camp is held every year to empower the ladies to forge their own path, equip themselves with the necessary knowledge to move away from certain deep seated cultural views that inhibit women’s active participation and progress to higher echelons. It has also organised the SWAN Family Camps at various resorts around the country to forge better family bonding.